8.5 miles of new biking paths and 4 miles of new hiking trails. The parking area is on Schoodic Loop Road, about 1 mile south of Route 186 in Winter Harbor. Satellite parking will be available at the Masonic Lodge and Winter Harbor Town Office on School Street in Winter Harbor. Rental weeks run from Saturday to Saturday. Check in is at 3PM on Saturdays and check out is at 11AM the following Saturday. Shorter or longer stays are welcome as long as they do not interfere with other guest booking their weeks from Saturday to Saturday. Please contact the owner if there are any special request. This property has been in my wife's family since 1964. It has been a place where her family vacationed during the summers and enjoyed the local wildlife and seashore. Great for bird watching. Close to Schoodic National Park. And a short drive to Bar Harbor or take the Winter Harbor Ferry for a fun cruise! We have been offering our home on HomeAway for the last few years and the people that stay here say they have had an experience of a lifetime. There are deer, rabbits and numerous wildlife sightings each day. See Birch Harbor, Winter Harbor, Prospect Harbor, Corea Beach & Schoodic Point all within 10 minutes of my property!! 629' water frontage on Grand Marsh Bay! With all the amenities of home. Cool ocean breeze and an abundance of wildlife. Its just a beautiful spot. The main level of the house is on the second floor with panoramic views of the water just feet away from the deck. Decorated with a nautical theme through out the home. A great kitchen and combined living , dining area for entertaining the family. Cathedral ceiling in the Kitchen/Living room with large windows on all sides. We have LL Bean Kayaks, Gas grill, outdoor fire ring for wood fires, outside furniture, Lobster pots with steamer kit, Wi-Fi, DirecTV with 315 channels including HBO. All of this at waters edge. The second bath has a washer and dryer. Acadia National Park’s new Schoodic Woods available for Biking, Hiking & exploring. Heat pump provides Air Conditioning. Lovely dining area with window seats around the table for enjoying the view. DirecTV premium package. HBO, Movie Channels, Disney channels, etc. A group of 6 women spent 6 days enjoying home, great location, scenic view from living area. Close to many short day trips. With the three washrooms and plenty of sleeping rooms we were very comfortable. 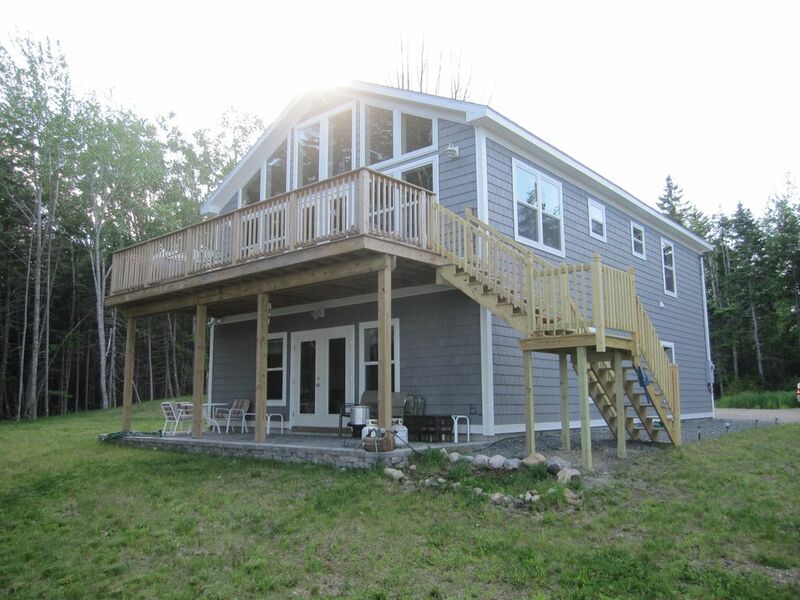 Owner very responsive to our needs, home clean and fully stocked, great fire pit, canoes and kayaks. Very pleased with our choice. Loved having you all. Please come again! Bernadette N.Where do you live? The house was beautiful ! It had everything we needed including the beautiful view ..
What a joy it was to have Bernadette Napp stay at our house. It was like having part of the family stay with us. Very neat and clean and respective of our home. I hope Bernadette and her girl friends stay with us again. Kitchen very well equipped; whole home has everything you could need and we all loved the kayaking. First I want to compliment Phil on his prompt response to any question I had. The house is EXACTLY as the pictures look. And clean. Very clean. (I have a cleaning business back home in MN, and I was very impressed). There were 6 of us who stayed at this home. And it was perfect. Everyone had their own rooms, bathrooms, space. It truly couldn't have been more perfect for my family and I.
gas grill. Seafood dinner two nights, yum!!! Go to Tracy's for Lobster. $5/pound and it's freshly caught that morning. The house has a fire pit, corn hole, badminton, 3 single kayaks, 1 double kayak and 1 canoe. I highly recommend printing off the tide schedule ahead of time (that's what we did) and it was very helpful as the tide changes everyday. The bugs are relentless, bring bug spray and yard guard, it truly is a must! This house is everything the description says. I highly highly recommend staying here. It's truly a slice of heaven. Thank you Phil for sharing your wonderful home!! Kim and I have turned our home over to guest for 4 years now. We open it up to them and treat our guest like family. Maybe better? We find that treating our house guest with respect and courtesy has lead us to stay in touch with our previous guest, whom now have become our friends and we stay in touch with them through emails and photos and now we get to see their family grow. They learn how to kayak at our properties and their memories of our home and the visit to Maine will last a lifetime. We are so honored that Tessah and her family stayed at our humble home. Glad they enjoyed their stay. Any HomeAway owner would be lucky to have Tessah and her family stay at their home. Excellent house, great location, very well decorated. You can truly relax here. Great house on the beautiful Schoodic Peninsula. It didn't feel like a rental - it felt like home. We had everything we needed and then some. The house is very comfortable with plenty of room for a large family or couples traveling together. The kitchen is well equipped and even comes with coffee beans. Phil made sure we had everything we needed. We loved seeing the deer in the yard, watching the sunrise in the morning and spending time on the deck enjoying the view of the water. We had a great time! I'm so glad you had your Indian summer you were looking forward to. See you next year! Rental weeks begin on Saturday and end on Saturday. No Personal Checks accepted.